The name of this Stampabilities, House-Mouse Designs Stamp is called" Time to Eat". I thought it would be so appropriate for a Mother's Day card. :) What do you think? Its from 2007, #MHOR1048. The sentiment is from Stampin' Up! 's "All Holidays" set. The main panel was diecut with Spellbinders and the center is popped with foam adhesives for extra dimension. The images are also popped and were colored in with pencils, chalks and markers. Rhinestones from Hero Arts anchor and finish off my card. I hope you have a wonderful week, my friend!!! This is darling! I love the shimmery paper and greatcoloring! This is gorgeous and I love that image - another new one to me. 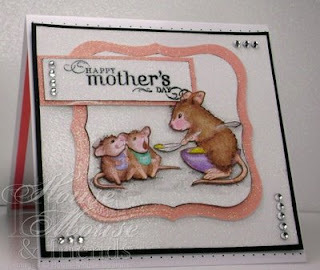 I love your layout and gorgeous colouring a super Mother's Day card. Girl - who needs flowers and ribbon when you've got this gorgeous coloring to look at?! And all those rhinestones and glittery papers are awesome!! I can't believe this pic was taken with a phone!?! Awwwwww, what a cute image for a Mother's Day card! Love it!! Great job with the clean and simple look. Love the glittery papers! Oh wow, this is sooooo sweet! I LOVE it. The image is just perfect for this theme and your layout is wonderful! Great job! That glittery paper and rhinestones are really pretty. Love your coloring and popping up the images. Beautiful card! Love your coloring and that is such a cute stamp! It is me again. I just wanted to let you know that I left a little something for you on my blog:o) I hope your day has been spectacular!!! America, this is so super cute and beautifully done!!!! Love the colors and coloring. Great bling detailing, too!!!! This card is adorable and has just the right amount of sparkle and shine!! Beautiful coloring technique and I really like the elegance of using a Nestie label to cut out the image. Love that shimmery CS and the rows of bling!! Cute card, It is such a shame that glitter and shimmer don't look good in pictures. I have the same problem. But your card still looks really good. Hey America!! Awww, such a cute card! Love the shimmer. . .I can see in the picture and it's beautiful. Love the nesties that you used. . .your coloring is fabulous!! What do you think of the 3 columns? All good? Let me know!